It’s not something I find easy to ask. 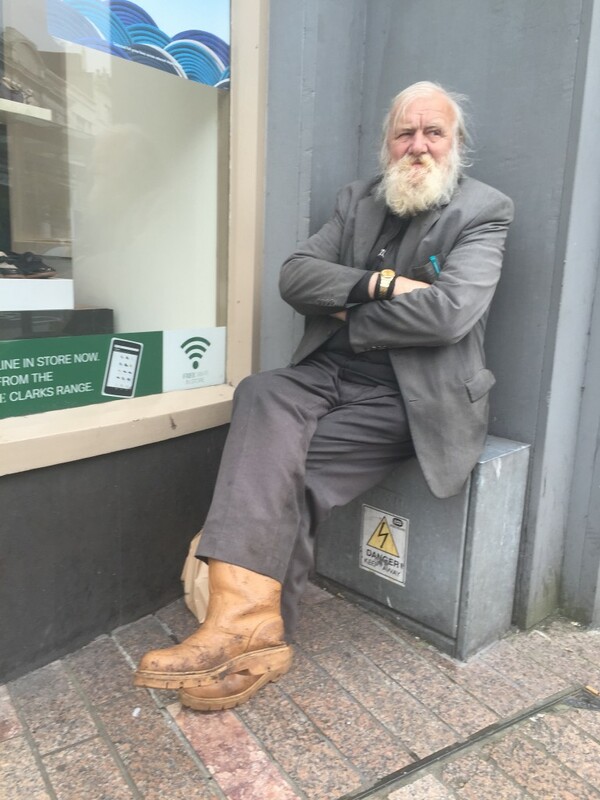 Take this situation I found myself in last Tuesday morning while waiting for a bus in Cork’s city centre. It was about 10 a.m. Town was quiet. 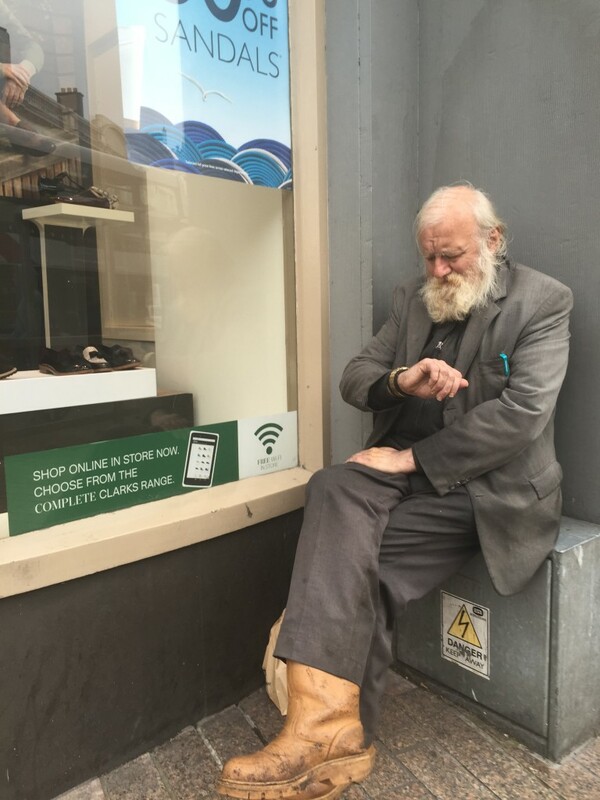 There were a few people heading to work, some early-morning shoppers, delivery people doing their jobs, and then this striking character sitting on an electric fuse box outside a shoe shop. Wow! Looking at it now, I am annoyed with myself. How did I miss the reflection? Usually, I am more aware than this. Another great opportunity lost. Anyway, this striking looking man was sitting; killing time. I was struggling. Should I ask him straight to take his portrait or be discreet and get a candid image? Hesitating, I furtively shot a few frames of him. I pretended to be looking in the shop window. I got a little braver and got another one or two of him, but all the while I just wanted to turn and tell the man that I found him fascinating and wanted to create a portrait of him. Street photography is difficult and, for me, even more difficult in my hometown. Put me outside Cork and I am much braver. Ya, I will rarely stop and ask someone for their portrait, but I will get down on my knees in front of them and shoot a frame or two. Nothing bad ever happens. 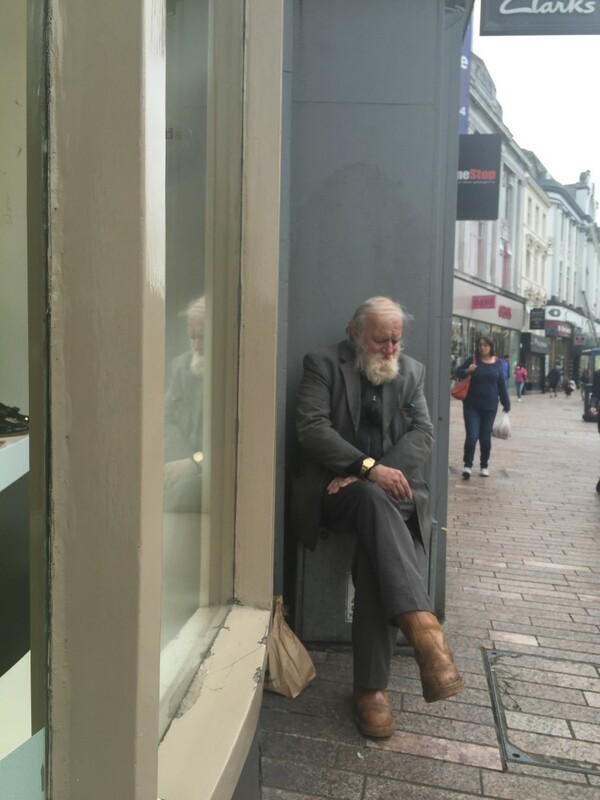 But in Cork… I don’t know. It was this shot, with him looking at his gold watch which got me. 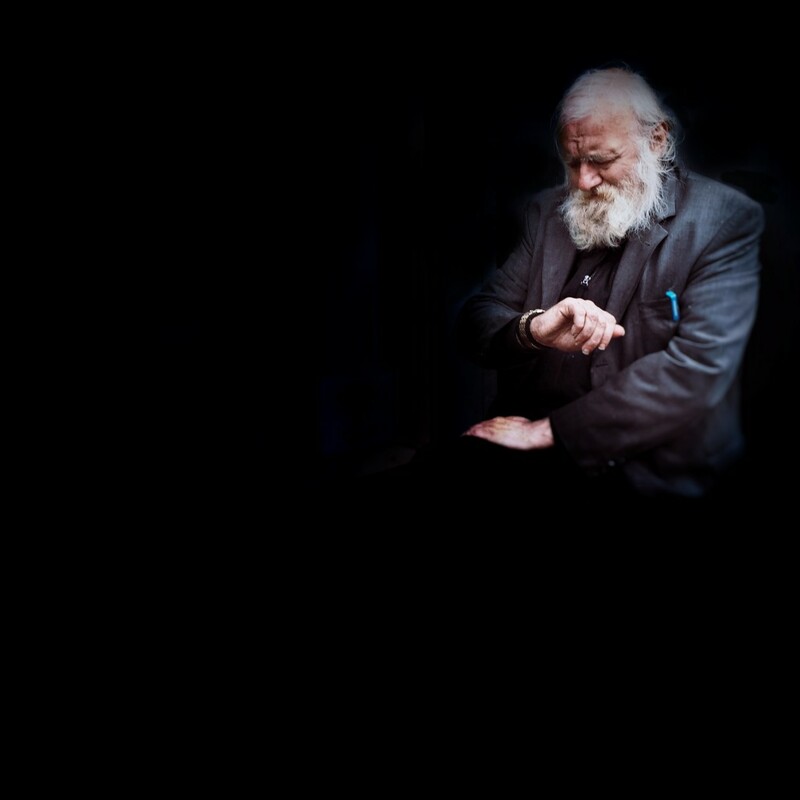 There he was, this man with a beard, grown over years, clothes aged and worn to their last and a gold watch that would not lie to him. I had the shot I wanted, but still I felt a need to connect with him; to thank him maybe, but in the short time I was there with him, we never once made eye contact; I never felt him aware of me. And then my bus came and the moment was gone. On the bus, I began to kill time with my favourite pastime – processing images. I began to work on the shot above using Darkroom. I am growing more and more fond of that app. I have the alpha version of the yet-to-be-released version and it is great. What I love about it is that you do not need to import anything; when you open it all your photographs are there. The alpha version has some beautiful preset filters. If you have not tried it -rush to the app store. Your photos will love you for it. I ran the shot through it and this is conversion. I cropped it to square to get rid of the distracting surrounds, did a little work on the contrasts, a little on curves (ya, it has curves) and this is the result. But I was not happy with the left side of the image – thinking it detracted from the main focus of the man. iPhone photography is great. Solutions are easily found. Snapseed has a great tool – brushes. I knew that I could isolate my character with the exposure brush – that and the vignette tool. Working on it on a moving bus is not the best idea, though. I worked a little on it, but finished it when I arrived at my mother’s house. While it is OK, I still want to do more on it. Things are never perfect. I will revisit this image. The crop needs to be readjusted. There is too much negative space at the bottom of the image and the execution around the edges should be finessed more. A little project to work on. I rarely spend a long time on post processing. Usually my edits are rapid. Two to five minutes max. But this one, I will persevere with. Let me know what you think in the comments below. I really would have loved to have asked him if I could take his portrait. I would love to find him again. Learn a little about him. Thank him. 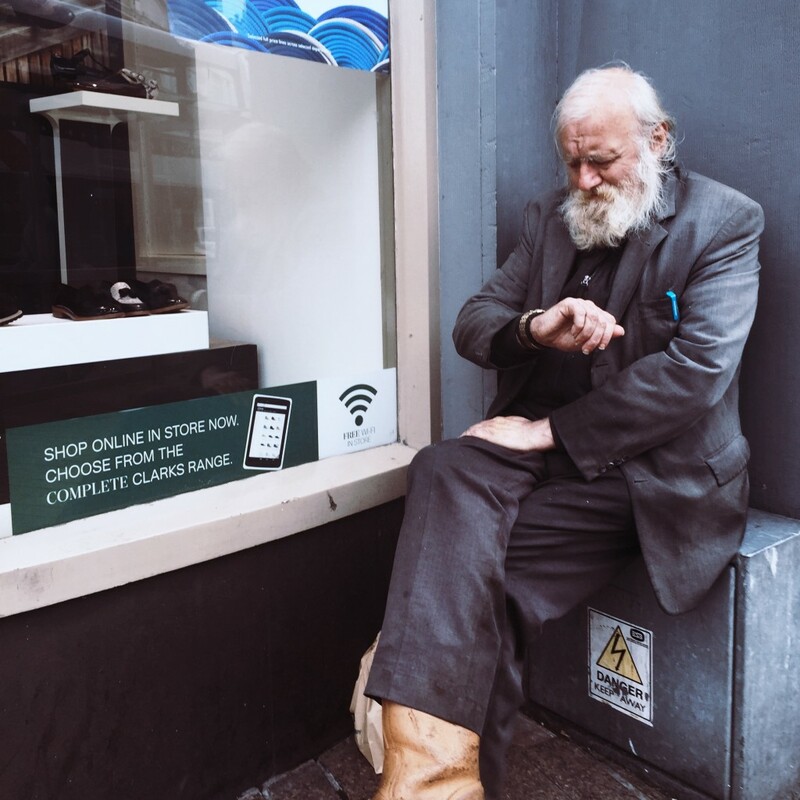 This entry was posted in iPhone, photograph posts, Street Photography and tagged Brendan Ó Sé, Brendan Ó Sé Apple Photo, Can I take your photo?, cork, Cork Street Photography, Darkroom App, iPhone Photography, Ireland, people, photography, Portraits, Shot on iPhone 6, ShotonIphone6, Snapseed, street photography, Workflow.